The North Island of New Zealand is blessed with spectacular scenery, ranging from bubbling thermal pools to fast flowing rivers. The best way to see all of this? Get up close and personal. 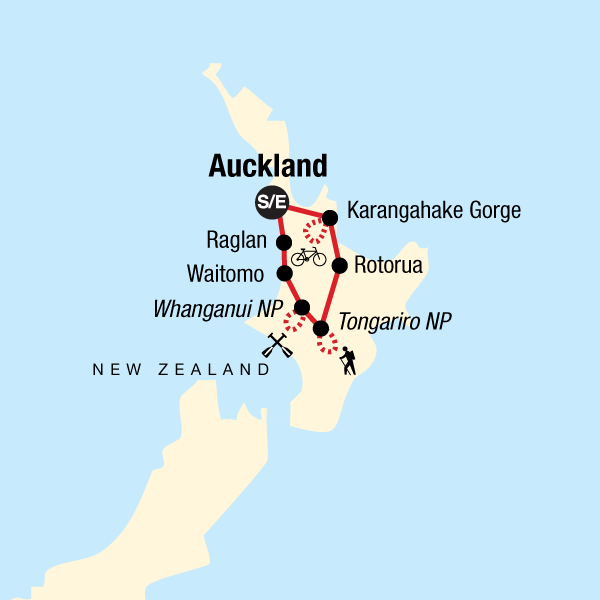 This itinerary includes biking through Karangahake Gorge and hiking the Tongariro Crossing — one of the world's most famous one-day hikes — before jet boats and kayaks provide the transport along the Whanganui River. Mix in some bubbling mud and a traditional hangi dinner, and this is the perfect active introduction to New Zealand. Enjoy a morning cycle through Karangahake Gorge, then travel to the Rotorua region to the Tamaki Maori Village. After a traditional greeting on the marae (meeting grounds), learn the arts of the haka and poi before a traditional hangi dinner. Enjoy a free day in Rotorua, a town in a geothermal area with boiling mud and hotpools. Opt to go whitewater rafting, tackle an offroad mountain bike track, go hiking, or hit the spa. Conquer the Tongariro Alpine Crossing, New Zealand's top-rated 1-day trek and spend time hiking an active volcano. Admire the scenery while heading to Whanganui National Park. Experience another of New Zealand's "Great Walks" (this time, from a canoe) on a day trip into the heart of Whanganui National Park. Explore the Whanganui River further by jet boat, visiting old Maori and European settlements. Travel north to the small town of Waitomo, located near an extensive underground cave system. Enjoy a free afternoon, and opt to tour the caves by boat, by foot or with a bit of adrenaline by rappelling into them. Continue on to Raglan for the night, and enjoy the sunset in this stunning coastal town. Visit an eel farm which focuses on developing sustainable aquaculture before travelling north to Auckland where your tour will end around midday. Hotels (4 nts), Maori village (1 nt, multi-share), lodges (2 nts, some multi-share).